An incidental non-invasive aspergillosis: An autopsy case report. Citation: Hossain A, Altaf E, Berry R, et al. 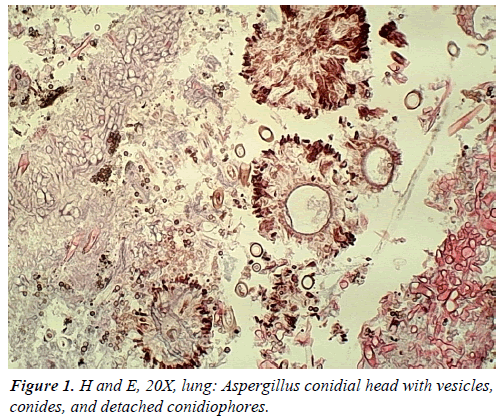 An incidental non-invasive aspergillosis: An autopsy case report. J Clin Path Lab Med. 2017;1(2):12-14. We present an autopsy case of aspergillosis where the decedent died from a house fire, but autopsy showed Aspergillus fungus ball in lung. An elderly Caucasian male who was a lone occupant of a house that burned in rural Kansas. He died of carbon monoxide poisoning without any skin burn. In addition to pink organs, autopsy showed a smoothly lined cavity that contained a mass of amorphous black and firm, ball-like mass in the apex of the right lung. Microscopically the ball-like mass was composed of a tangled mass of fungus fibers, blood clots, and white blood cells. There was no fungus in other organs. 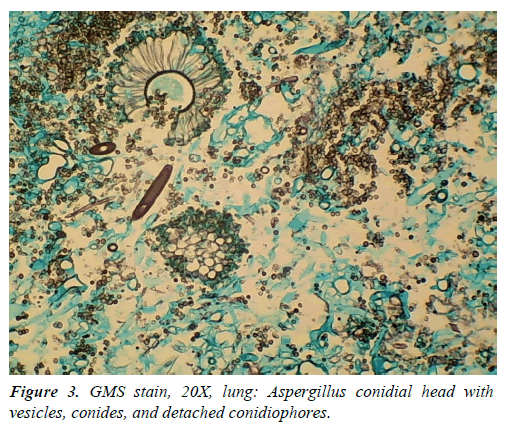 GMS stain demonstrated numerous Aspergillus organisms forming a mass with fruiting heads and the presence of a mycelium with conidial heads comprised of vesicle, metula, conidia, phialides and detached conidiophores. This article demonstrated a non-invasive pulmonary aspergilloma with distinct and characteristic pathologic feature of aspergillosis in a case who had died of carbon monoxide poisoning in a house fire. Aspergillosis, Hyphae, Conidial head, Fungus ball, Gomori Methenamine Silver (GMS). Aspergilli are saprophytes and are present worldwide. Most human infections are caused by the species Aspergillus fumigatus . The natural ecological niche of aspergillus organism is the soil, wherein it survives and grows on organic debris. It is one of the most ubiquitous of those with airborne conidia . Colonies of the fungus form from conidiophores. Aspergillus sporulates abundantly, with every conidial head producing thousands of conidia. Conidia released into the atmosphere have a diameter small enough (2 to 3 μm) to reach the lung alveoli . So, humans and animals constantly inhale numerous conidia of this Aspergillus. In the immunocompetent host, conidia are normally eliminated. The dissemination of A. fumigatus usually relies on disturbances of the environment and strong air currents. Once the conidia are in the air, their small size makes them buoyant, tending to keep them airborne both indoors and outdoors. Environmental surveys indicate that all humans will inhale at least several hundred A. fumigatus conidia per day . For most patients, therefore, disease occurs predominantly in the lungs, although dissemination to virtually any organ occurs in the most severely predisposed patients. Aspergillus fungus may present in many different clinical situations with a wide spectrum of pathology in human. The manifestations in lung can be pulmonary aspergilloma, allergic bronchopulmonary aspergillosis, chronic necrotizing pulmonary aspergillosis and invasive aspergillosis. This article focuses on an incidental unexpected and unsuspected pulmonary aspergilloma in a decedent, which became the contributory cause of death and the main cause of death, was carbon monoxide poisoning. An elderly Caucasian male was alone occupant in a house fire in rural Kansas. The decedent was discovered dead, kneeling next to a toilet. There was no direct exposure of the decedent to radiant heat. The decedent was known to be heavy smoker and was a known alcoholic. History included chronic obstructive lung disease (COPD). He was very ill and reportedly movement was limited by chronic illness. This case became a coroner’s case because of the house fire, eventually deemed electrical in origin. The decedent's immobility did prevent him to escape from house fire. Autopsy revealed right lung apical adhesions, densely matted right lung tissue with a 5 cm × 3 cm × 2 cm smoothly lined cavity that contained a mass of amorphous black, firm material not adherent to the chest wall. Both lungs had extensive emphysematous bullae, most prominent in the apical areas, consistent with bullous emphysema. Hemoglobin was 78% saturated with carbon monoxide. Microscopic examination revealed finely divided, dark pigment granules in the mucosa of bronchi and a ball-like mass composed of a tangled mass of fungus fibers, blood clots, and white blood cells in the lungs. The fungus ball destroyed surrounding lung tissue. There was no fungus in other organs. The fungal ball was consistent with an Aspergillus fungal mass with fruiting heads. GMS stain showed the presence of mycelia with conidial (fruiting) heads comprised of vesicle, metula, conidia phialides, and detached conidiophores (Figures 1-4). Figure 1: H and E, 20X, lung: Aspergillus conidial head with vesicles, conides, and detached conidiophores. Figure 2: GMS stain, 10X, lung: Aspergillus conidial head with vesicles, conides, and detached conidiophores. Figure 3: GMS stain, 20X, lung: Aspergillus conidial head with vesicles, conides, and detached conidiophores. Figure 4: GMS stain, 40X, lung: Aspergillus conidial head with vesicles, conides, and detached conidiophores. Aspergilloma consists of a spheroid mass of hyphae embedded in a proteinaceous matrix with sporulating structures at the periphery. A common symptom of aspergilloma is hemoptysis, however, the decedent had no history of hemoptysis, due to lack of disruption of blood vessels in the wall of the cavity occupied by the fungus and there was no disruption of the bronchial artery supply. COPD patients are at risk of developing pulmonary aspergillosis, specifically invasive pulmonary aspergillosis, because they are treated with corticosteroids . No pathognomonic clinical presentation of invasive pulmonary aspergillosis or aspergilloma exists in COPD patient. In the differential diagnosis in COPD patients with chronic infection, aspergillosis should be included, and effort should be made to find the accurate diagnosis, and thereby treated accordingly. Aspergilloma and invasive aspergillosis usually require therapeutic intervention with antifungal agents, such as Amphotericin B and itraconazole. Although aspergillosis can be treated with antifungal agents, the infection is fatal in a high ratio in immunosuppressive patients. The curative and mainstay of treatment is surgical debridement, but medical interventions are also performed with the advent of newer available anti-fungal agents . At the present time, treatment is disappointing but surgical options available for the management of aspergilloma. This article demonstrated a distinct and characteristic etiologic agent of the pulmonary disease which was thought to be COPD. The early correct diagnosis should have been made and proper treatment should have been instituted. Autopsy studies and articles on Aspergillus pneumonia or aspergillosis in forensic journals are relatively rare. We present an autopsy case of simple pulmonary aspergilloma where the decedent died of carbon monoxide poisoning but autopsy showed Aspergillus fungus ball in the lungs. Lee SH, Lee BJ, Jung DY, et al. Clinical manifestations and treatment outcomes of pulmonary aspergilloma. Korean J Intern Med. 2004;19:38-42. Mullins J, Harvey R, Seaton A. Sources and incidence of airborne Aspergillus fumigatus. Clin Allergy. 1976;6:209-217. Raper KB, Fennell DI. Aspergillus fumigatus group. In: Raper KB, Fennell DI (eds). The genus Aspergillus. Baltimore, MD: The William & Wilkins Co; USA. 1965:238-268. Hospenthal DR, Kwon-Chung KJ, Bennett JE. Concentrations of airborne Aspergillus compared to the incidence of invasive aspergillosis: Lack of correlation. Med Mycol. 1998;36:165-168. Kirsten D, Rieger U, Amthor M, et al. Invasive aspergillosis in cavitary lung sarcoidosis. Pneumologie. 1992;46:239-242. Venanzi-Rullo E , Fortun-Abete J, Nunnari G. Diagnosing invasive pulmonary aspergillosis in COPD patients: More challenging and less rare than before. A review of the literature. Infect Dis Trop Med. 2016;2:e341. Moodley L, Pillay J, Dheda K. Aspergilloma and the surgeon. J Thoracic Disease. 2014;6:202-209.